Paytm is here came with the amazing Paytm Mobile Recharge loot offer for all users. Yesterday Paytm presented Paytm Republic Day Special Recharge loot offer and an awesome Paytm cash loot offer for all users. Paytm always presented so many Recharge loot, cashback coupons, promo code and many more. 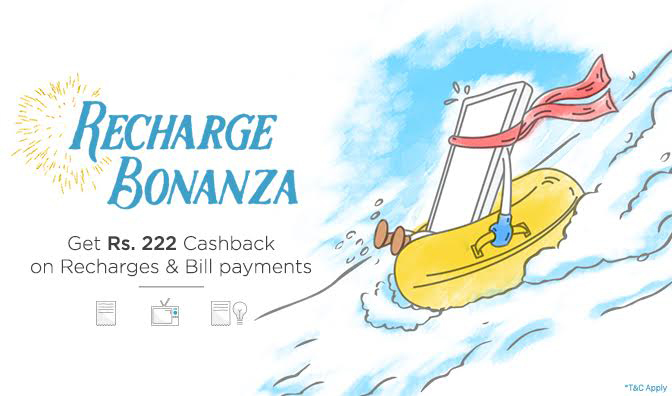 Now Paytm presented Paytm Recharge Bonanaza offer in which Paytm is offering Free Rs.222 Cashback on Recharge & Bill Payment. This offer is valid for all users. In this offer their is three offer. You can use this offer on Mobile Recharge, Bill Payment, DTH Recharge and also on Electricity. So get ready for the awesome offer and recharge your number and get free cashback in Paytm wallet. So hurry up and avail the Paytm new Recharge Promo code in this month. NOTE : This offer is valid only for today (31st October, 2016), For All Users. Initiate a Mobile Recharge & Bill Payment. Apply Promo code from above offers and proceed next. Finally you will get upto Rs.222 cashback within 1 hours. Enjoy the Paytm Recharge loot offer. Maximum cashback per user per number is Rs. 222. Each code can be used 2 times per user. A number can be recharged only 2 times per code. A number can be recharged only 6 times using this campaign. Valid on 31st Oct, 2016. Promocode is not valid on Airtel Prepaid, Postpaid, D2H and Landline. Hi friends Earn Talktime & Free Talktime app giving rs 200 as promotional recharge offer. Install the app and get many exciting gifts. sorry bro for wrong info, this offer is valid on Recharges, Bill Payments, Data card, Landline and DTH Recharge.